Posted in: "Darwin Took Steps"
Written by Glendon Mellow On November 9, 2012 In "Darwin Took Steps", "art 4 sale", "arthropod", "flying trilobite"
So I’m sitting in an airport on a long layover in the middle of the night, excited to be heading to ScienceOnline 2012 for my 4th time. CNN is on repeat, talking about the SOPA protest blackouts by Wikipedia and others. I’ve for science-based imagery on my mind. Like many science bloggers, I enjoy a good dressing-down of superstition and religion in the face of facts and reason now and again. On the plane, I was thinking about how the simple symbols can sometimes be the most powerful. I’m not a graphic designer, my work is too messy and complex, but I appreciate powerful designs when I see them. It’s an incredibly descriptive little diagram. It’s possible to imagine other ways to depict evolution by natural selection: a wildfire, spiral river-eddies, interlocking Venn circles, perhaps. But Charles made an awkward, halting little tree that still describes his theory well even after the discovery of DNA and cataloguing the genome. I was thinking: what if some skeptic, atheist group really promoted it, really rattled religious cages successfully and it became an important, loud rallying symbol? In the news, punk kids wearing it on their knapsacks. Talking head on CNN dismissing stunts an graffiti without understanding it. Charles Darwin drew that little tree, but due to copyright laws, there’s no claim he can posthumously make for it. Or his estate. So it could be used by a noisy group he would have disavowed for their tactics and there’s nothing anyone could say about it. Because copyright eventually expires, and the most impact-full images are remembered and echo through culture. The echo might get distorted but we still hear/see it. Da Vinci, in his attempts at joining noble society would no doubt have lost his temper when Dadaist Marcel Duchamp drew a moustache on a print of the Mona Lisa. But even before copyright laws, our society understand that sometimes preserving images from the past means re-imagining them. This is why, even as an artist and content-creator, I oppose SOPA. Eventually, all artists have to let their creations live in the world. Punishing the unfettered creativity of the Internet and sometimes, even the artist’s own fans is just fighting against the life-cycle of an image. Creators *do* have the right to nurse their creations along. Let them go. At your own speed, of course, make your career, control your creations, steer them to the right clients and in service of the right causes and genres. But one day, they’re going to go off on their own. Written by Glendon Mellow On January 20, 2012 In "#scio12", "Darwin Symbiartic", "Darwin Took Steps", "copyright"
My general philosophy of parenting is heavily informed by Dale McGowan's excellent Parenting Beyond Belief and my own upbringing surrounded by tons of books on a variety of subjects. Teach many things, teach a child to think critically and let them figure it out. Still, nothing wrong introducing the little guy to art, science and his dad's vocation at an early age. Written by Glendon Mellow On June 7, 2011 In "Darwin Took Steps", "SONSI", "family", "personal"
What a terrific day. I`ll report more later. In the meantime, head to SONSI prez Emily S. Damstra`s blog to see more pictures of our exciting gallery show of nature and science illustration at the Royal Botanical Gallery. Written by Glendon Mellow On May 2, 2011 In "Darwin Took Steps", "Glendon Mellow", "SONSI", "gallery", "personal", "science art", "scientific illustration"
Click to enlarge! On throughout May! Show starts tomorrow! Check SONSI for more deets!!!!1!eleventy!! Written by Glendon Mellow On April 29, 2011 In "Darwin Took Steps", "SONSI", "art 4 sale", "gallery", "parasaurolophus"
Postcard design by Jennifer Osborn. Illustrations © individual artists of SONSI. Postcard design by Jennifer Osborn. For the month of May, I'll be taking part in the Southern Ontario Nature & Science Illustrators first gallery show at the Burlington, Ontario, Royal Botanical Gardens. You can view the press release here. We've got upwards of 25 members in SONSI, and I can't wait to see this show. I also think this show will be Darwin Took Steps's sawn song - it's easily my most popular image, but I don't want to keep pushing it. Time to put my best foot forward with something new. Actually, I'm hoping maybe to do a series of prehistoric critters as brightly coloured and as stylized as the Pink Parasaurolophus. Maybe an alphabet? I think framed like it is above, it could make a nice series of prints for a child's bedroom. If you're interested in this print, you can also get them framed or unframed in my online store. Written by Glendon Mellow On April 8, 2011 In "Darwin Took Steps", "SONSI", "art 4 sale", "gallery", "parasaurolophus", "reproductions"
Sorry, I'm a day late picking the winner. Too many good entries! I changed my mind 3 times. "Preconceptions dropped away / As he stood atop Bartolome. / For Darwin, a glimpse of nature's plan: / Ascent of stairs, Descent of Man." The winner: e_journeys / Elissa Malcohn! Congratulations Elissa! Contact me by email or FB or Twitter, and send me your mailing address! I'll get that print in the mail for tomorrow. For all of you who participated, thank you. Some of my other favourites were by Adrian, coturnix, soniah, Joseph and Arvind. I loved the imagery by everyone about standing on giant's shoulders (appropriate with the little stairs - never thought of it that way before) and the humour in so many entries. Tommy's Lady Gaga comment was great on Grammy night. Don't forget you can pick up Darwin Took Steps prints, framed prints, stickers, shirts, greeting cards and potcards in my online store. A portion of the profits goes to support The Beagle Project. And don't miss this post by Karen James of The Beagle Project on Scientific American's Guest Blog. This contest is purely for entertainment purposes and fun. I won't be held liable for sciencey-artsy fun under any circumstances. The winner's print will not originate from my online store: I will make it in my studio on museum-grade paper with standard inkjet ink. Written by Glendon Mellow On February 14, 2011 In "Darwin Day", "Darwin Took Steps", "contest"
My thanks to everyone who tweeted and shared and especially entered my Darwin Day contest that I posted on Friday. The contest was to provide a tweet-length (140 characters) commentary about my painting Darwin Took Steps - humour, poetry, insight all acceptable. Winner gets a signed print. It's science-history-surreal-portrait-art, it can be fun. Here are all the entries. Brilliant stuff. Sorry, I didn't mean to stair. - Richard Carter, FCD. And he's building a stairway to heaven. With a word he built it on Darwin's head. 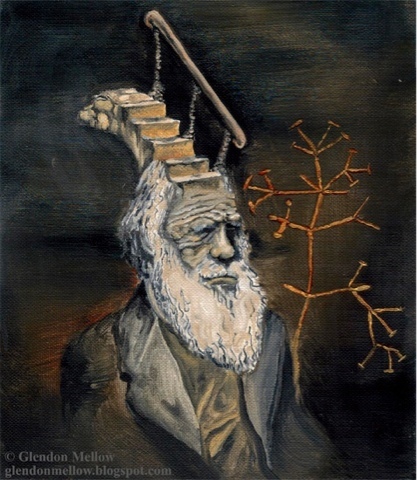 Written by Glendon Mellow On February 13, 2011 In "Darwin Day", "Darwin Took Steps", "contest"
Several weeks ago, I began working on a new painting for Darwin Day. However, with other deadlines looming and and still being awestruck by the existence of my newborn son, the new Darwin painting isn't near finished. But let this day not go unmarked at The Flying Trilobite! Time for a contest. Write something about my Darwin Took Steps image in 140 characters or less (the same size as a Twitter tweet). It could be a fictional quote, a line of poetry, something to do with The Beagle or evolution by natural selection. Will you focus on the stairs? The beard? The tree of life? A comical way he got a staircase on his head? A knock-knock joke? I'll leave it fairly open-ended. Amuse me. Contest closes at 12:01 am eastern standard time February 13th 2011 and I'll post the winner on the blog that Sunday. Multiple entries allowed, but they cannot be a series. A whole thought in one 140 character entry. Entries should be submitted as a comment on this post on my blog, not on my Facebook or Twitter or other rss feed related places. The winner will receive a signed Darwin Took Steps print in snail mail. Remember, you can also order this print in a variety of ways from my online store, and a portion of the profit goes to The Beagle Project. Written by Glendon Mellow On February 11, 2011 In "Darwin Day", "Darwin Took Steps", "contest"